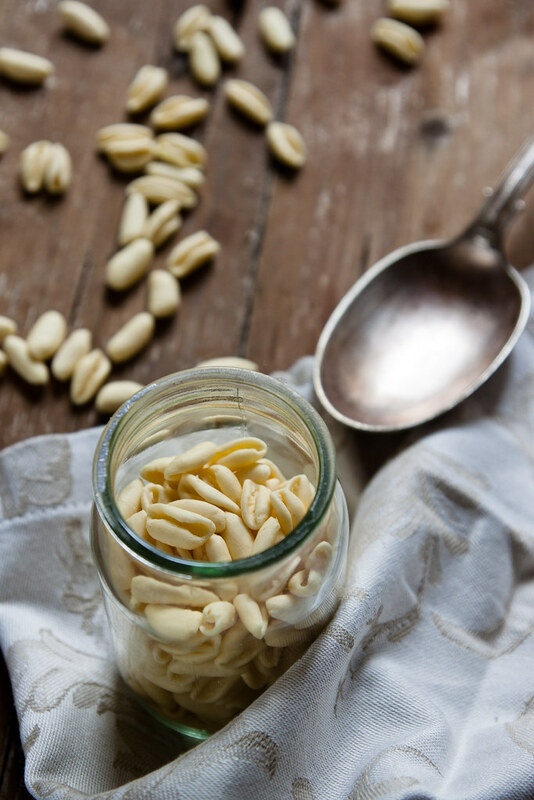 Before marrying your grandfather and going on our honeymoon in the South of Italy, in the Basilicata region, to visit my in-laws, Grandma told me, I had never heard of pasta and… pasta and potatoes, pasta and fava beans, pasta and beans… We used to eat pasta, soup or broth, but we had never had a pasta cooked that way! This is what my grandmother told me when I asked her where she learnt to cook pasta e patate, pasta cooked with potatoes, one of the most comfortable dish you can think of in a cold winter day. 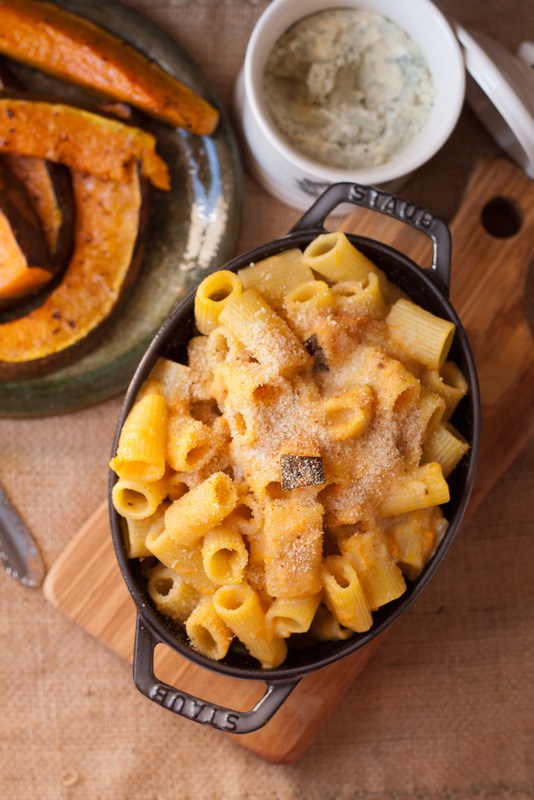 Pasta e patate is a traditional dish, belonging to the inventive food tradition of South Italy. My grandma Marcella learnt to cook pasta with potatoes from my Aunt Valeria, my granddad’s sister, and from that day of many many years ago she developed her own recipe, revised according to our ingredients, to her personal taste and cooking style. 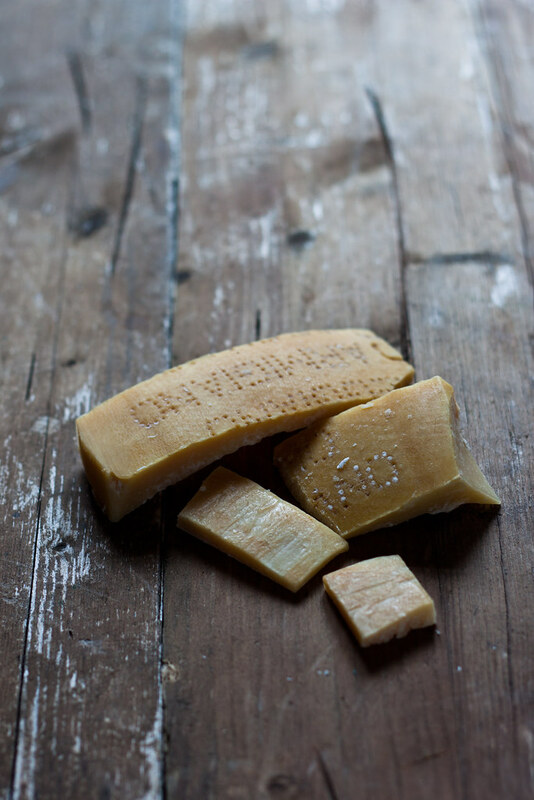 For example, instead of caciocavallo, a hard and sharp flavoured pear shaped cheese from the South of Italy, we use grated Parmigiano Reggiano and also the leftover crusts of this cheese, cut into cubes. Once you boil them for a while, they become soft and chewy, giving an intense flavour to the broth. From unknown recipe it became the rewarding and cosy dish of cold days. In these snowy days Grandma comes often to our house at lunch time with a wooden tray with all the ingredients, already measured and divided into small bowls, and while we set the table she cooks us for our pasta with potatoes in a small pot on low flame: this is her secret in the kitchen. 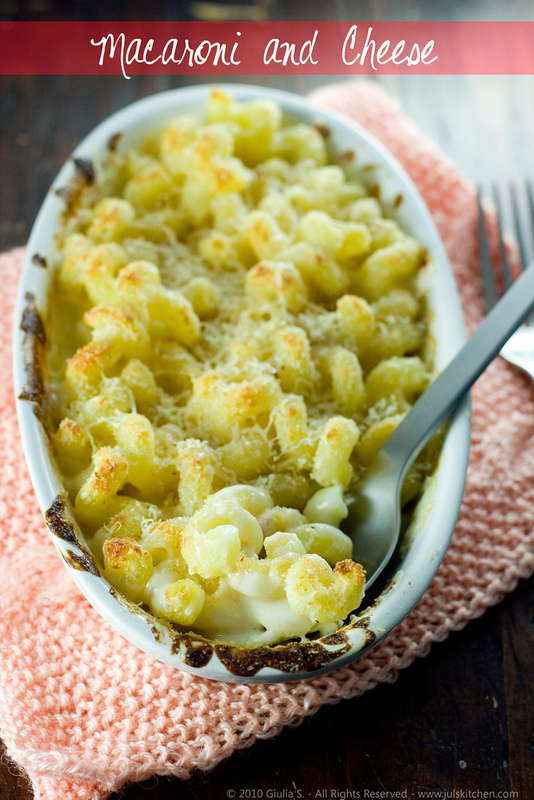 As befits the traditional Italian peasant cooking, few ingredients are used in an inventive way to produce a rich taste and a creamy texture, made even more enticing by the alternation of potatoes and pasta with cubes of chewy crusts of Parmesan. A hint of freshly ground black pepper or a pinch of crushed red hot chilly pepper will add the right amount of fire to warm you up, from inside out. It is highly recommended to hold the bowl of pasta with potatoes in your hands on the coldest days and to inhale the cosy scent with closed eyes before you eat it: a stream of home and family memories will pass through your eyes. This is the power of simplicity. Pour the extra virgin olive oil in a medium sized pot and add the finely sliced onion. Cook the onion over low heat for a few minutes, stirring often, until golden. Add the diced potatoes and a spoon of tomato sauce, which will give a pinkish and inviting colour to the pasta and potatoes. Stir to mix all the flavour, then cover with hot salted water. Cook over low heat for about 10 minutes, then add the short pasta and the crust of Parmesan cheese and cook for 10 up to 15 minutes, until the pasta is cooked. Stir often once you add the Parmesan crust because the cheese will tend to stick to the bottom of the pan. 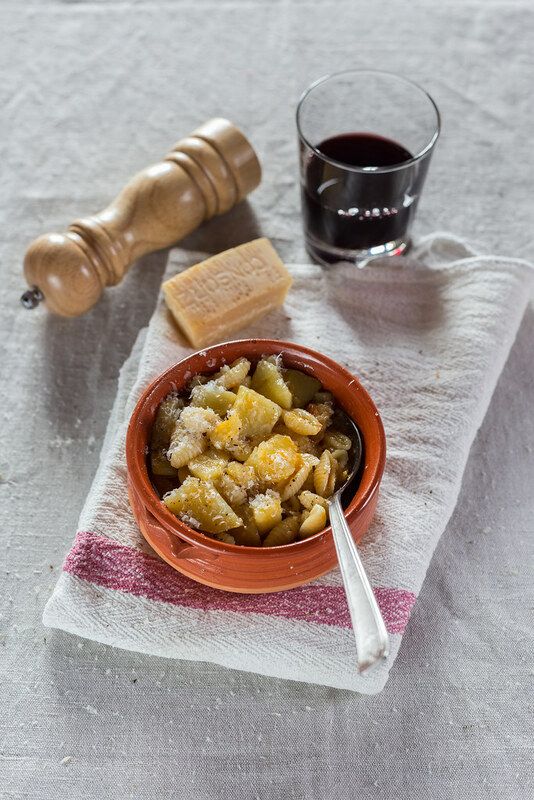 When the pasta and the potatoes are cooked through and the cooking liquid has been almost completely absorbed, leaving a thick and creamy soup, remove the pot from the heat and serve with grated Parmigiano Reggiano cheese and a pinch of black pepper or dried chili. thank you Juls for stopping by on my blog, your recipes are really inspiring. 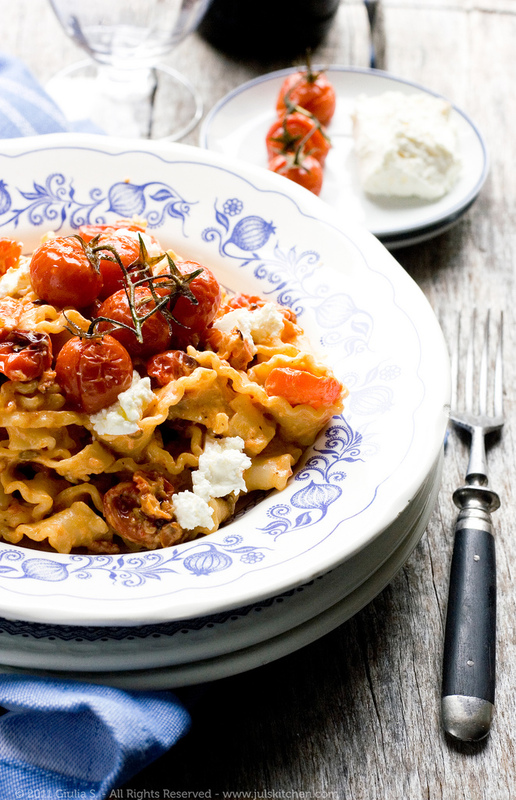 This is interesting because we, Hungarians, have a traditional pasta & potato meal! 🙂 I cooked it last week! We cook the potato, then saute onion in a pan. We add the half mashed potato, season with salt, pepper and paprika. We also add some pasta water to it to make it a bit creamier then we combine this with the cooked pasta. It is true a winter comfort meal! I like your post much better – straight-to-the-point. 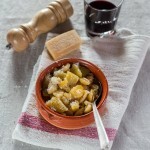 Giulia, can’t thank you enough for this lovely dish and beautiful memories you shared at my blog! A wonderful combination and interesting dish! So comforting and nourishing. thank you so much! all your comments and feedback are the greatest inspiration for me! I have never thought of putting pasta and potatoes together – I do make chickpeas and potatoes very often. I am anxious to try your recipe, it looks delicious. chickpeas and potatoes? uhm, interesting!! This dish look soo good! I love the combination with potatoes. I’d be in starch heaven! Yum. Haha, this would be heaven for my carb-loving wife! 🙂 Looks delicious and creamy! Juls, what an interesting idea to pair pasta with potatoes. Both are such comfort foods on their own, but together? Yum. The dish looks quite creamy and almost ‘saucy’, really lovely. I really appreciate seeing rustic, simple ingredients (and not necessarily too many of them) come together to create an elegant and comforting dish. Thanks for sharing this family gem, my friend! I’ve never actually made this dish but have many friends that this is a staple in the house. Feeling a bit under the weather, this sounds like it will be perfect for today. thank you. Hi Daniela, here it is! This is a recipe that my grandmother (a New York native, second generation from Ischia) would make us growing up. It’s so simple and fulling and delicious. It brings back such memories. I made a big pot of it tonight for my sister. We call it Pasta Padon. I always just assumed that Padon meant potato, but I can’t find anything anywhere to indicate that. My gut (which is full at the moment) tells me that this may mean something like ‘padding’. lol. Thank you for posting the recipe. IT’s great to see how others make it. 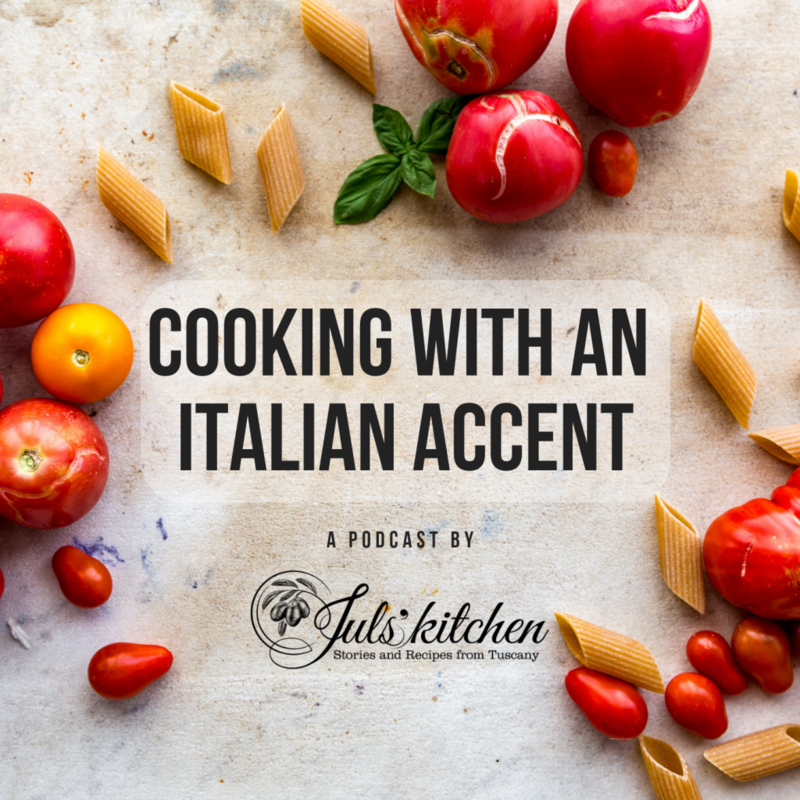 I am thrilled that I’ve finally found Juls’ and Tommaso’s blog. I feel like I’ve been looking for these recipes my whole cooking life! I’ve wanted to make pasta and potatoes for a couple of years, since I first heard of the dish, but haven’t found a recipe that looked promising. I read once that there aren’t many of these recipes on the American circuit because American portions are so large, a dish with two major starches is unfathomable. I used Juls’ recipe here as a side dish with a summer salad main course (I couldn’t wait till winter to try it), and I was blown away by how much flavor you can get out of so few ingredients in such small quantities if you pay attention to your elders and SLOW COOK EVERYTHING. Food already has everything it needs for us, substance and flavor together. We just have to trust it in its own, patient time to release all of its goodness. So don’t rush this. And add tomatoes if you want. Add rosemary if it’s right. This dish is adaptable because it’s so simple, and that’s the kind of purity we all want in our lives and the lives of those we feed. Thank you, Juls. Rachel, your comment made my day. The way you used this recipes is just perfect. Moderation is the answer, and with a conscious way of eating even a pasta e patate, with two starches together, can belong to a balanced meal. The way you understood the recipe, and the use of ingredients… I really want to thank you, because this is the reason I blog and share my recipes! thank you, Rachel!